Fortnite: Battle Royale's long-awaited refund system is now live with update v4.3, giving players the opportunity to get some V-Bucks back for a returned cosmetic. You are only able to refund three items in your lifetime, and they must be purchases from within the past 30 days. If you want to refund an item you bought last year, you're out of luck. In order to start the process, navigate to the Settings in-game. Then, move to the far right tab called Account and Content. There, you will see your Epic Account ID and a section called Unintentional Purchases. 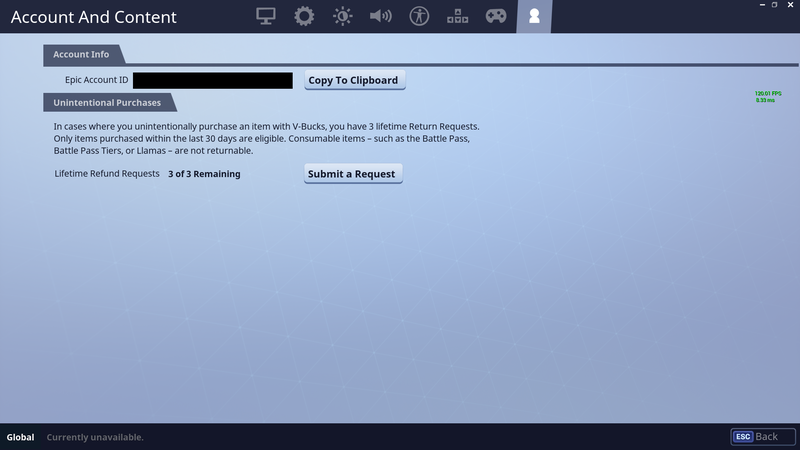 "In cases where you unintentionally purchase an item with V-Bucks, you have three lifetime Return Requests," says that section. "Only items purchased within the last 30 days are eligible. Consumable items such as the Battle Pass, Battle Pass tiers, or Llamas, are not returnable." From here you can click on Submit a Request. The next page will show you all of the cosmetics you have purchased within the past 30 days. You can then click on the cosmetic you want to refund, and you have to give a reason as to why you want a refund. The options are Accidental Purchase, Unauthorized Purchase, or Item Not as Expected. From that point, good luck. You can submit the request and hope that Epic Games agrees with your reasoning and refunds V-Bucks into your account.